So here we are, one season down and one sixth seventh of the way through (damn you, Hunters). Thanks to all of you for reading, especially everyone who has commented, e-mailed or passed the site along on Facebook or Tumblr. Zero Two starts up Thursday! Adventure was always going to be the most interesting re-watch, since it was the only one I'd never watched straight through. 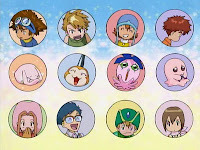 It's also the only season that is universally liked among Digimon fans. While everyone may not call it their favorite, it manages to avoid the polarity of future series like Frontier or Xros Wars. Nostalgia is probably a big factor in that. Adventure is certainly not without its faults. It takes the longest to get into full gear. 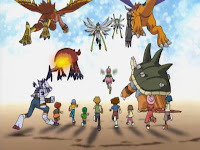 Most seasons start out with several introductory episodes to showcase each of the characters and their Digimon. All of the other seasons do it better. It also must be said that the other seasons drastically reduce the number of times someone gets crap thrown at them. It's a shame that the first season has a rocky start. Who knows how many impressionable young viewers never got to see the full glory of the franchise because they dismissed the show too soon? Probably the most amazing thing about Adventure is how the poorer episodes early on are completely removed from the equation in favor of the second half, which is just plain outstanding. Each kid gets their own story, family issues reach the surface and the sight of Tokyo under direct attack weighs far more heavily than the passive approaches Devimon and Etemon had taken against the Digital World. By the time the Dark Masters tear up the place, sights of previous landmarks in disarray have more sentimental impact. The hidden key to that arc is the cumulative toll of all this battling. It wears down on everybody and deters the effort more than any of the Dark Masters are able to. This is something that is rarely seen again as most of the remaining seasons take place over a longer stretch of time. It's a unique element that adds so much to the series, and it will be missed. In that regard, the biggest revelation to me was Mimi's role in all this. She ended up being stress exemplified and I found myself liking her more for it. Her breakdown adds a huge sense of realism to the picture, and despite never catching a break she manages to overcome it. She was a necessary annoyance in the first half, but in the second she becomes the necessary dose of sincerity for the series as much as the team. It's not as sad a farewell as it will be later, as we all know we're seeing these guys again next season. Still, season one's all over, so there's nothing left to do but cue up the ending theme! Catchier song... more interesting graphics... still next to no animation. Yes, they started using this ending in the episode Gatomon was introduced as Myotismon's servant. You can also catch a few shots that were assimilated into the dub opening once Kari joined the team. Yes, Mimi was amazing this season. I feel like she's one of the strongest female character's Digimon has ever had.